Police have asked for the remand of two men, one suspected of tampering, the other the technician who repaired the gas line, for questioning. Police in Netyanya are seeking the remand Friday of two men in relation to last night's fatal gas explosion which killed 4 and injured 50 in order to question the men over the weekend. The men are to appear in the Petah Tikva District Court. One of the men, Yisrael Daniel, is a technician with the PazGaz Gas Company, who police say inspected the building's gas tanks mere hours before the deadly blast. Police interviewed his superiors as well. An unconfirmed report indicates police are investigating whether Gueta may have intentionally cut the gas line in relation to a feud he is having with another business owner in the building. Daniel is being held while police determine whether there was negligence on his part. The four story building adjacent to Ha'atzmaut Square in downtown Netanya houses some 150 families on its upper floors while the ground floor is home to various businesses. Several of the businesses are owned by the Abutbul family, an alleged organized crime syndicate in Netanya, Israel Radio reported. Public Security Minister Yitzhak Aharnovitch who came to personally survey the scene said, that while terror had been ruled out, investigators have yet to determine whether the explosion was an accident, negligence or foul play. "Our working assumption is that this was caused by a gas tank, although nothing is certain. There is a strong smell of gas. What's important now is to evacuate all the injured from the building. Searches are still underway. There are probably people on the upper floors that were not hurt but are trapped. It may take hours to get them out. The rescue services will go room by room to search for trapped people," Aharnovitch told Israel Radio. 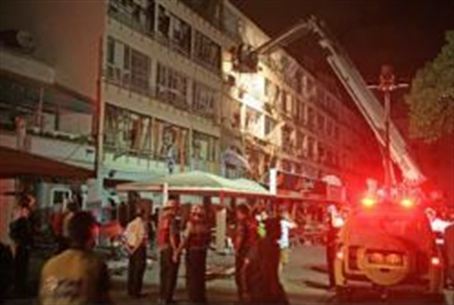 All 150 apartments evacuated and remained off limits to residents while rescue teams continue to search the debris surrounding the building for more injured people. City structural engineers are inspecting the building to determine whether it is safe for residents to enter and retrieve their belongings Three people were still missing as of Friday morning. The Netanya municipality is attempting to provide residents with a housing solution as Shabbat approaches. Eight of the tenants, so far, have been put up in hotels in the city.